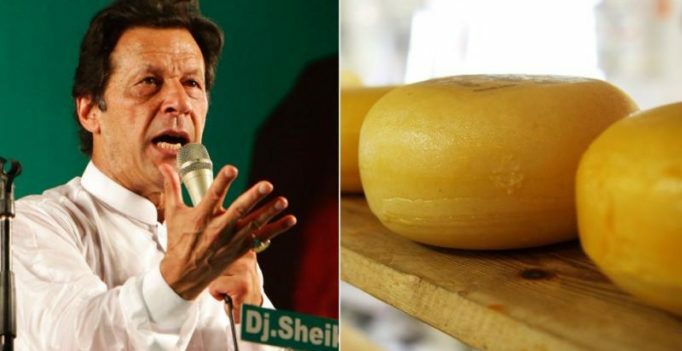 In a bizarre move that is being slammed by critics and opposition leaders alike, Pakistan’s new Prime Minister has decided to ban cheese along wth embargoes on other foreign products such as luxury cars and phones. According to The Times, the newly elected PM believes the move will help the country stave off a USD 12 million bailout from the International Monetary Fund. A water crisis has also prompted the former Pakistani cricket captain to ask for donations from Pakistanis around the world to help build a new dam. The cheese ban has prompted jokes from critics including suggestions that three-times married Khan wants to “Make Pakistan grate again” – in a nod to US President Trump’s election mantra. Social media users have also complained that the country’s pizza, already considered poor, will deteriorate further because of the controversial embargo. Experts point to the fact that foreign cheese imports, worth £2.5m, make up 0.01 per cent of Pakistan’s current deficit of £13.5 billion. Talking to The Times, Miftah Ismail, former finance minister said that the move won’t make any difference. “The economy is the real challenge and the government has to make serious decisions instead of these small things,” he added.